We are excited to be moving to SFU Harbour Centre this year! Here are the spaces we will be using, and their accessibility information. Please enter from W Hastings! For more info, follow this link. The hallways have sufficient room for maneuverability of a standard wheelchair. The majority of the hallways are open; however some corridors have an AUTOMATIC DOOR with push button activation. All washrooms have lever push doors, except where noted. GENDER NEUTRAL 1364, east corridor, north end (heavy lever push handle). WOMEN’S & MEN’S 1560, south corridor, west end, past BC Gas Trans Mountain Pipeline Cinema (lever push handle). ACCESSIBLE washroom in between WOMEN’S & MEN’S 1560. 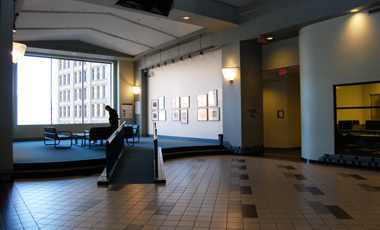 Street Level/Main Concourse: The main entrance is located on the south side of the building, off of Hastings Street (can be accessed via ramp and AUTOMATIC DOOR with push button activation). This is the recommended wheelchair entrance to the SFU Harbour Centre building. This space divides into four rooms. 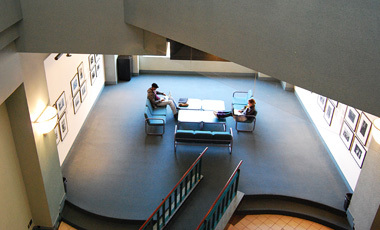 Fletcher Challenge Canada Theatre, centrally located, west side (ramp leading to door, located on the northeast end of the room). Optimal seating for wheelchair users may be at the front. A ramp may be requested for specific events for the purposes of providing access to the stage for wheelchair or scooter users during award ceremonies or special presentations. However, the door is not wide enough for the lift to fit through and it is very difficult to bring the lift in from alternate entrances. The lift itself is large and cumbersome.